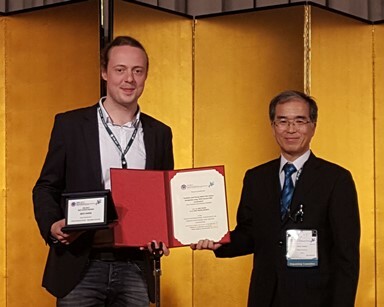 Jani Tiemann was awarded the "Best of the Best Papers"-Award for his latest submission to the International Conference on Indoor Positioning and Indoor Navigation (IPIN) in Sapporo, Japan. The paper "Scalable and Precise Multi-UAV Indoor Navigation using TDOA-based UWB Localization" describes a novel, radio-based, scalable, high-precision positioning algorithm. This contribution opens up new possibilities to deploy autonomous robots in scenarios such as logistics or emergency services. The jury particularly acknowledged the innovative new concept as well as the extensive experimental validation. The submission is an important contribution to the subproject A4 of the SFB 876 and the CPS.HUB/NRW.